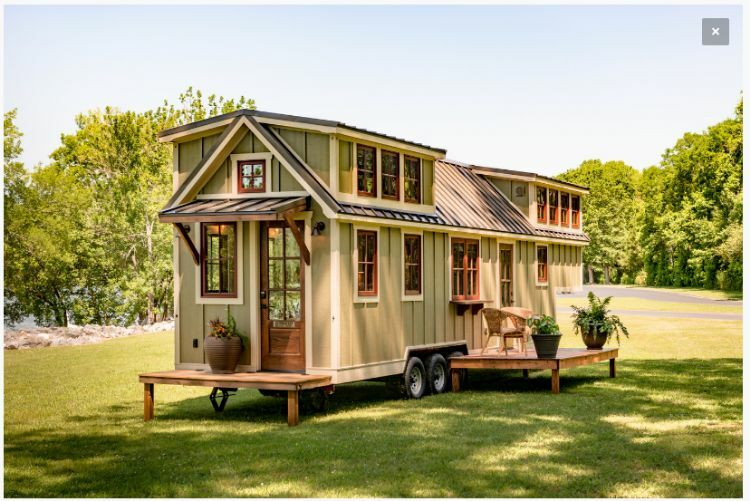 Alabama-based Timbercraft Tiny Homes has been building handcrafted tiny homes ever since 2014. 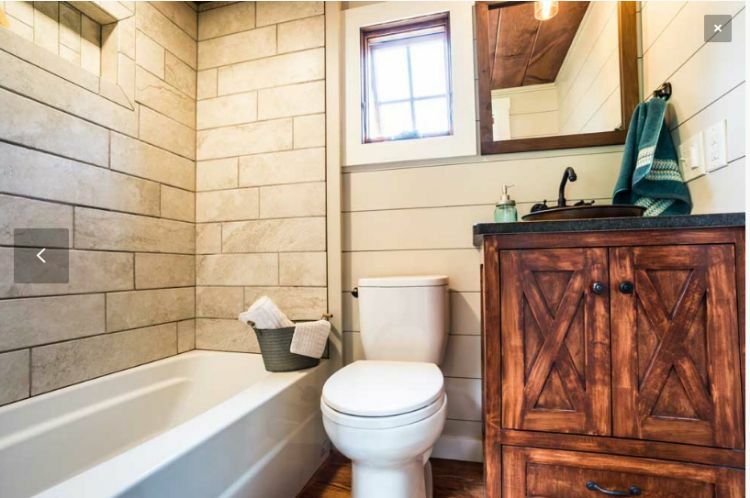 A quick browse through the gallery on its website and you will immediately notice that each of the homes is well-designed with close attention to details. 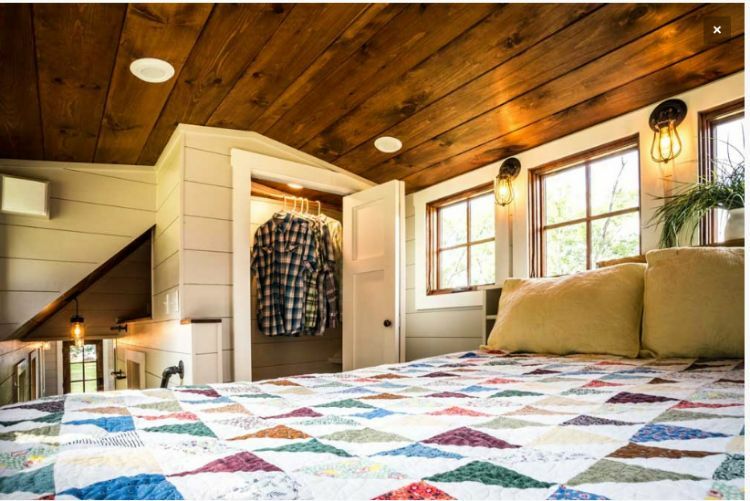 One of their models, the Denali, comes with several unique features such as an outdoor shower and two separate outdoor areas, namely a deck and a porch, as well as high headroom inside the home. Several customization options are available for people who want to build a truly unique home. 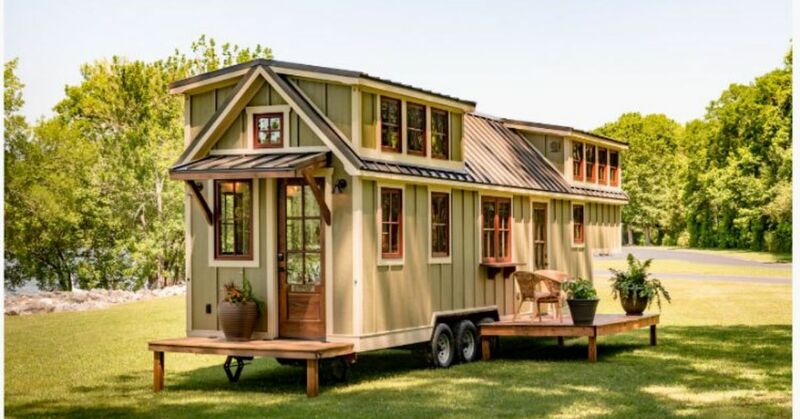 This Denali home is a gooseneck trailer measuring 37 feet long, 8-1/2 feet wide and 13-1/2 feet tall. It features pine stained-grain doors and Pacific Wood-clad windows. 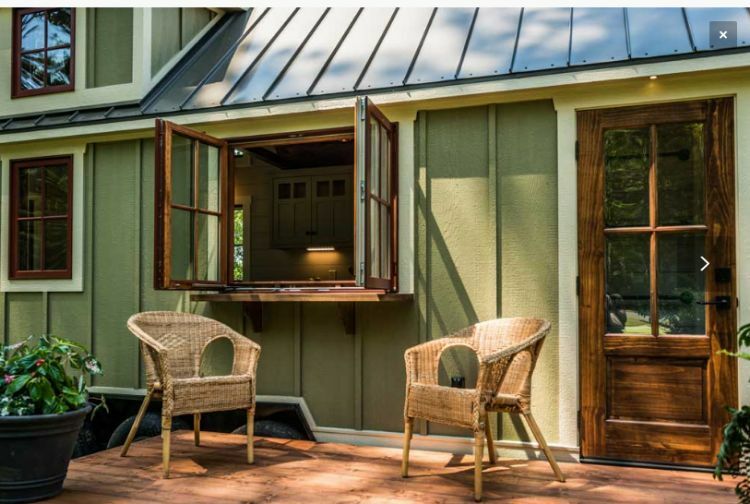 The area right in front of the main door offers a foldable porch that easily stores away for traveling. Enjoy the sun outside on the deck. A couple of wicker chairs in natural tone are parked right next to the open window. Two potted plants give life to this open space. With its 11-foot-high ceiling, you won’t feel claustrophobic when you step into the living room. 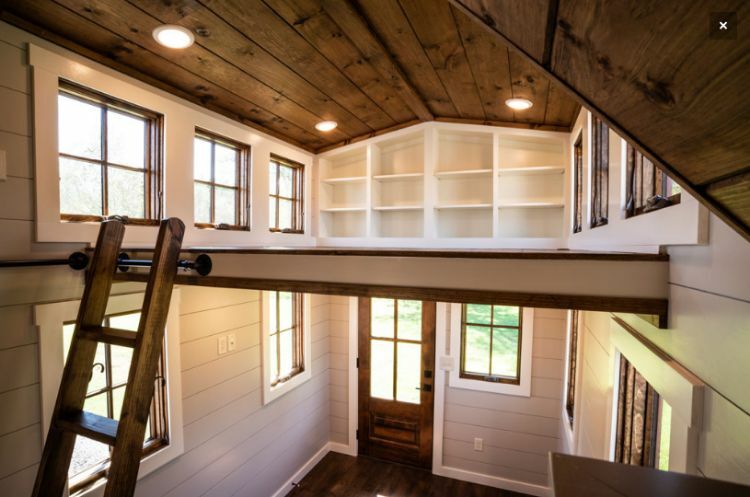 The clerestory windows admit a lot of fresh air and sunlight. The dark brown upholstery on the couch matches the pine floor while the textured rug underneath it adds to the cozy feeling. LED bulb lighting gives a soft, warm glow inside at night. The custom-built cabinets in the kitchen have inset doors. Appliances include a gas range and an oven as well as a full-sized stainless steel refrigerator with a freezer. Washing dishes is easy in the large stainless sink. Choose from two separate eating areas; eat at the bar across the peninsula area or enjoy the view outside while using the bar by the large French casement window. The headroom in the bedroom is approximately 6 feet 7 inches in the middle and nearly 6 feet on the sides. The built-in queen bed sits atop storage drawers. The built-in headboard comes with storage as well. Windows on both ends of the bed allow more sunlight to come in. The closet includes a hanging bar as well as a shoe rack and built-in shelving. This tile shower surround sets the tone in the bathroom, which comes with a bathtub, a standard flush toilet and a vessel sink. 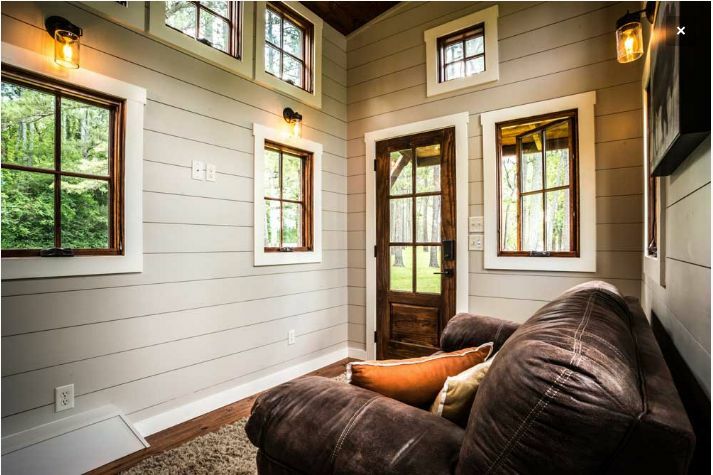 A sliding pocket door gives homeowners needed privacy without taking up extra space. 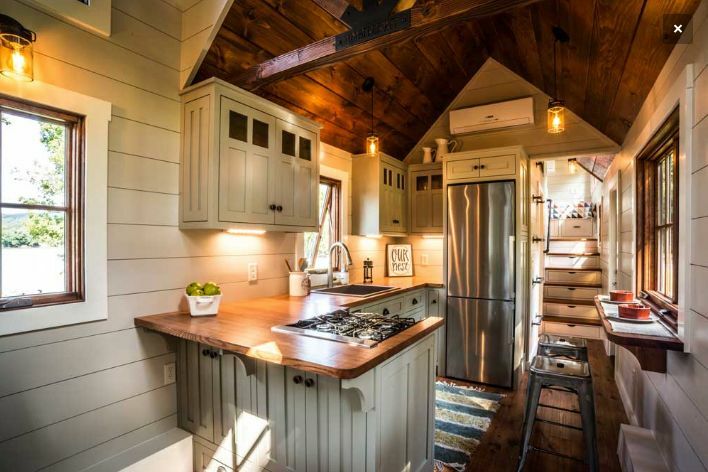 If you like inviting guests to sleep at your home, you can have a loft included in the trailer. This optional feature is a smart choice because aside from functioning as an extra bedroom it can be used for additional storage or as a space to relax.